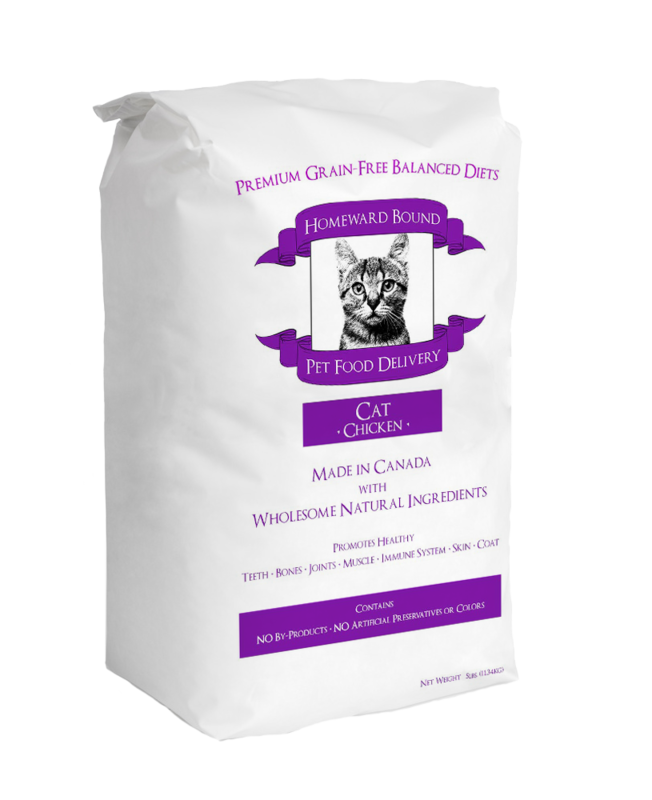 Our Homeward Bound Grain Free Chicken recipe features a well-balanced diet suitable for cats of all ages, sizes, and breeds. Our recipes are made in Canada with farm-fresh natural ingredients including protein-rich chicken that will provide your cat with the exceptional nutrition and endless energy it needs to live a healthy and happy life. All cats are different so amounts will vary depending on breed, age, activity level and climate. Use the feeding chart as a guide to achieve your cat's ideal weight. Kittens need up to 2x and pregnant/nursing cats 3x the adult requirement. Serve dry or slightly moistened. Keep bag sealed for freshness. Store in cool dry place. The HB Chicken Cat Recipe is formulated to meet the nutrition levels established by the AAFCO Cat Food Nutrient Profiles for maintenance.